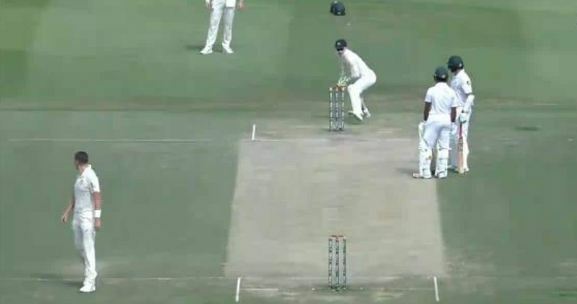 Azhar Ali loses wicket in silliest ever run-out! Pakistan’s opening batsman, Azhar Ali, was playing against Australia on third day of the second Test with his confidence sky high, but little did he know this over ‘self-belief’ will cost him his wicket and that too in the silliest manner! On third day of the Test, Azhar Ali, on 64, edged past gully on the third ball of the 53rd over bowled by Peter Siddle. His partner Asad Shafiq ran towards him as the ball was travelling to the fence. To everyone’s surprise, the ball stopped about a feet away from the boundary line. Fast bowler Mitchell Starc raced to the ball and threw it to the keeper’s end. Both Azhar and Shafiq it went for a boundary and so they didn’t run at all. Later, Aussie skipper Tim Paine knocked the bails off while these two Pakistanis were having a chat. Eventually Azhar was given out for 64 (141). Pakistan lost their fourth wicket in the innings in the most bizarre way. Pakistan started the day with 144/2, leading by 281 runs in the second innings. They lost Haris Sohail to Nathan Lyon early in the morning. No.5 Asad Shafiq joined half-centurian Azhar before the bizarre happening.